After you have a set of core Needs from doing step 1, you are ready to come up with solutions for those needs, which is just another way of saying startup ideas. Because these Needs are unsolved, you are going to have to come up with a creative solution, that doesn’t exist yet. Sound tough? it is, but we have a couple of secrets for you. first, an entrepreneur is really just a creative problem solver. And what makes them ‘entrepreneurial’ is that they are relentlessly solving problems creatively. That’s really what step 2 is about, how to think creatively and become great at ideation. A team from the QØ Catapult Incubator Ideating, look at them go. It’s a commonly held belief that some folks are born with an innate ability to be creative, and others aren’t. Actually, everyone can have great ideas with the right environment, prompts, and habits. Creativity isn’t about creative people, it’s about creative acts. Each of us has come up with at least one good idea in the past. Maybe you figured out ways to make a process faster, a product better, a service cheaper. Yet even in the face of that proof, we often dismiss our own abilities to be creative. The first step to being more creative is acknowledging that it’s a skill, not a talent. Ideation is a skill. And like any skill, it takes dedicated, conscious practice to improve. What spurs you to have your best ideas? Whatever it is, do it more often. When can you practice More? Make it happen. What other techniques can you employ? Brainstorming is not the only kind of ideation. As you work to enhance your creativity skills, you’ll be amazed at how many great ideas you have. Seriously, you are inherently better at ideation than adults, but you lose this as you get older so you need to practice, that’s what the following steps are for. While you are naturally better at ideation, you also have a tendency to overlook existing solutions that you could augment, tweak, and mash together creatively to build a new solution. Don’t always try to reinvent the wheel. Read on for tips on how to come up with a great startup idea. Consistently coming up with great startup ideas isn’t luck. With the right practices, environments, and habits, we can all get better at generating ideas. It was Ben Franklin who said that ‘Necessity is the mother of invention.’ A principle he applied throughout his life to a host of innovations that are impressive for their breadth and variety, as well as their ingenuity. Ben franklin invented a number of things include the bi-focals and swimming fins for your feet. Thanks, Ben. The iconoclastic designer Yoshiro Nakamatsu has created an extremely personalized, sophisticated environment to stimulate and nurture his creativity, including sensory deprivation tanks and special stereo goggles that project patterns intended to put him into his creative sweet spot. Ever noticed how you best ideas come in the shower? Yoshiro was a master at creating spaces where we was free to think creatively, you can see how a swimming pool would be a good place. Walt Disney pushed his creative staff to over-the-top designs for Disneyworld installations and movie plots. He continually challenged his team to come up with new ideas, to amuse and amaze him; according to several accounts he demanded independent and daring thinking outright. Having a partner to bounce ideas back and forth off of is key, you will noticing things in each others ideas and build off them. Here’s something you can do in 3 minutes to warm up your creativity. You are going to need a piece of paper and something to write with. Your task is to come up with as many uses for a pencil as you can think of. You get 3 minutes. Go for Quantity. Do it now! Over the years, one universal truth we’ve noticed is that if you want to come up with better ideas, come up with more ideas. Quantity yields quality – the more ideas you have, the more likely it is that some of those ideas are going to be great. And coming up with bad ideas is key. It’s those absurd ideas that can help us ricochet back to the really great ideas we’re looking for. The first few minutes of an ideation session are really about unloading all of the obvious solutions so that you can get to the good stuff. So don’t stop after 5 minutes. A ‘quick’ brainstorm rarely works. At some point, the quality of ideas hits a plateau. And that’s when experienced ideates will start throwing out all sorts of random thoughts. Most of those ideas will be pretty dumb. Hopefully, the ideas get stupid enough that we start to laugh, or take the conversation in unexpected directions. Like magic, brilliant ideas will start to appear. Better ideas show up over time. But more importantly, in order to get to the next plateau of quality, you have to be willing to go through rough patches when all of the stuff you’re coming up with is absolutely silly, impractical or irrelevant. 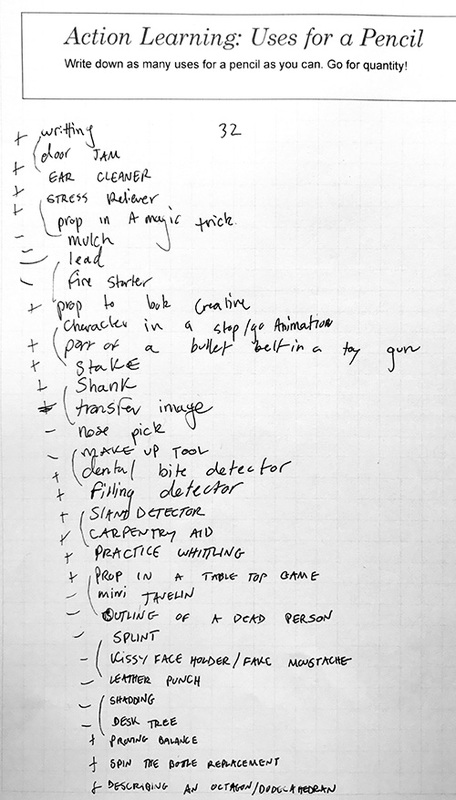 Example 3-minute brainstorm for uses of a pencil. I got 32! try to beat me. Here's an example half-sheet from a QØ Catapult Incubator team. Even simple drawings can be helpful in bringing an idea to life and communicating it to others. Select one of your Needs and explain any context around the Need, who it came from, etc. Continue this process until you have 20-30 1/2 sheets each representing a distinct idea. Quantity yields Quality! Once finished, find a table or wall to layout all the ideas, take 5 minutes and have people look through all the ideas again, on their own, and put a star next to the 3 ideas that they think are best. At the end 5-8 ideas should rise to the top as peoples favorites. Have a discussion about why people chose what they chose, any patterns you notice, and as a group decided on the top 3-5 ideas you want to move forward with. 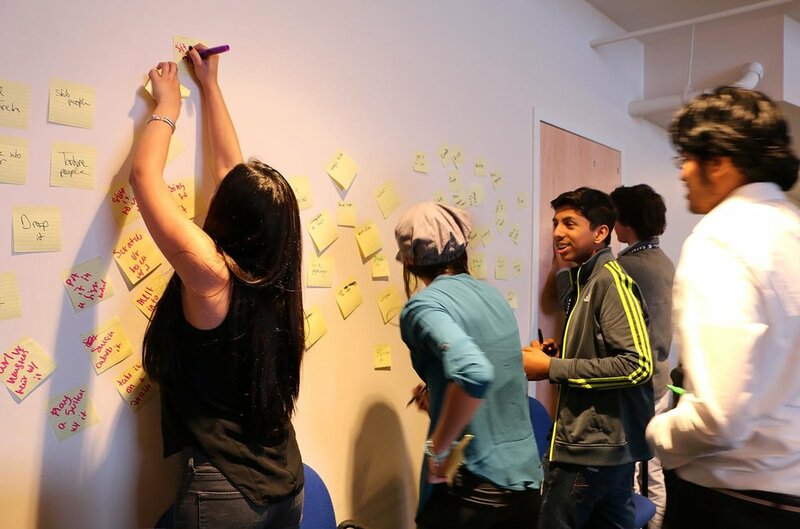 As an entrepreneur, ideation isn’t something you do once, it happens over and over again. By nature, entrepreneurs are creative problem solvers, and ideation is one piece of creativity. You must have Needs as the starting point for good ideation. You may come up with good ideas, but if they aren’t solving peoples needs, then you don’t have a business. Don’t forget, creativity can be learned, keep honing your skills. Now that you have your top ideas, it’s time to test them out! That’s where prototyping comes in, making your ideas real, quickly and cheaply, so that you can see if people actually like/need/will pay for what you are proposing. Ready? take me to step 3: Prototyping - how to test if my ideas is any good. Buy this Idea Log used by Chris Kosednar, Quarter Zerø Product Lead, himself.